A Brazilian modeling agency has launched a shocking and confronting campaign that they hope will rid the fashion industry of unhealthy body standards once and for all. Star Models has released images of it’s ‘Say “No” To Anorexia’ campaign and it has set tongues wagging. The campaigns feature fashion sketches as drawn by a designer, and positioned next to the sketch is a real model who has anorexia in an effort to show how unrealistic and unhealthy the standards of fashion can be. While it is a very bold move, some have criticized the campaign saying it doesn’t do anything to help the plight of young models who develop eating disorders. 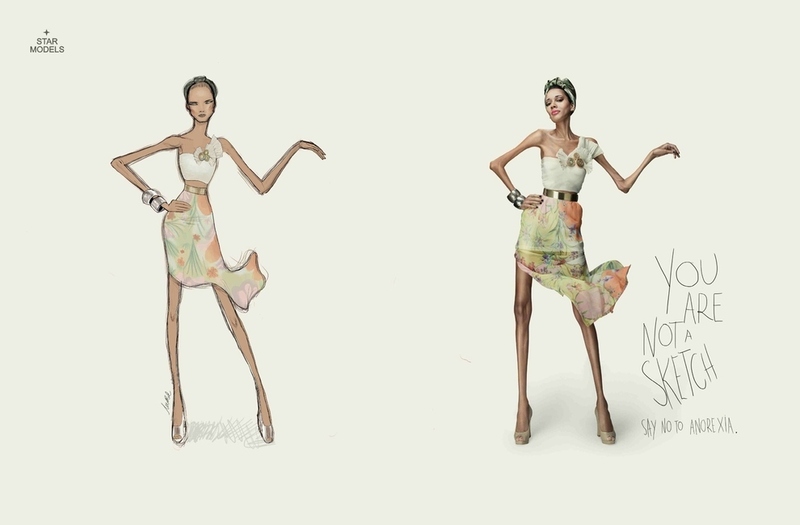 The fact that it pictures an anorexic model next to a sketch seems to imply it is the fault of fashion designers that girls have anorexia in the fashion world. Let’s make this clear, the campaign is designed to shock and create conversation, which it is doing very well. We have been blog posts about this very campaign from the Daily Mail in the UK, to Buzzfeed, and NY daily news. Eating disorders are not a black and white issue and anorexia is a very complex disease that has to be treated very carefully. Anorexia has been a trending topic in Sweden lately and this story was quite alarming. A Stockholm treatment center for eating disorders said talent scouts from modelling agencies had approached their patients outside the clinic, hoping to recruit them. “They were outside the building and waited for the girls to go out for a walk,” the director of the public institution said. This breaks our hearts. While it is easy to point the finger at who is to blame the most when it comes to detrimental body images in the beauty industry, the fact is every person involved needs to be accountable. There are young girls who don’t know any better and would literally die just to fit into a dress for the catwalk. Is this the kind of reputation fashion wants to shoulder moving forward? We interviewed Cami Julaine, a young singer and actress from LA who was mentored by Paul Abdul when she had an eating disorder. She went into treatment at Rebecca’s House in Orange County at the age of 16 and now, at the age of 18 is bravely speaking about how it affected her teenage years. She says as a young girl growing up it was hard to deal with so much media pressure on how she thought she needed to look. The media and beauty industry needs to start setting better standards, and it if takes a shocking campaign like this then good! People can criticize the wording, the sketches and anything else, but its the message that means the most. If it is causing decision makers and powerful people in the fashion world to change their way of thinking it means it is working. Thank you Star Models for starting a conversation that is important and will hopefully help millions of young women in the world aspire to be healthy, not sickly thin. Goodbye Thinspiration!